Some 10 billion land animals are raised and killed for food every year in the U.S. alone. Globally, that number climbs to more than 60 billion, and doesn’t include the trillions of fish and other sea animals killed by commercial fishing operations. Of all the non human animals exploited by humans, Animal Charity Navigators estimates that 99.7% are animals used as resources by animal agriculture. 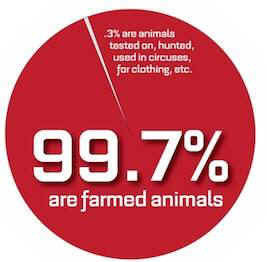 The remaining .3% consists of all of the others, such as those hunted, tested on, abandoned to shelters, and used for fashion and entertainment. While factory farming is increasingly drawing public criticism as a result of countless undercover investigations and cruelty exposés by animal rights organizations, it’s important to understand that animals suffer in all farmings systems, including small and so-called humane farms, and that all animal agriculture has disastrous consequences for the environment. See this section of our Free From Harm website that is devoted to shining a light on the often hidden cruelties involved in the production of meat, dairy and eggs, from factory farms to small operations. Farm animal investigations provide valuable insights into the lives of animals exploited for food, who are forced to endure a battery of mutilations, physical and psychological suffering, and a violent death at only a fraction of their natural lifespans. While bearing witness to this collection of video footage can be painful, it is important to know the truth about our food choices and to encourage others to make the connection as well. Bearing witness is a critical step in the process of changing hearts and minds about the animals trapped in our food system.